Former president Bill Clinton still has a locker at Trump National Golf Club, where he has been a regular for years. Clinton's love for Donald Trump's golf course in Chappaqua, New York, isn't something he brings up often now that Hillary Clinton is facing off against the billionaire for the presidency, but according to a picture snapped by former NFL quarterback Boomer Esiason on Tuesday, the locker remains in pristine shape. Esiason was getting good treatment at the course if his locker was next to Clinton's. The former president "practically [has his] own wing in the locker room at Trump National Golf Club," according to Westchester Magazine. When asked by Golf Digest in a 2012 interview whether he belongs to any golf clubs, Clinton mentioned only Trump National. "I play at the Trump course [in Westchester]," Clinton said. "When people come to play with me, that’s where I take them. I have a membership there." The Clinton Foundation directed questions regarding the current status of Clinton's membership at the golf course to Clinton's personal office, which did not respond to an email. Hillary Clinton's campaign also did not respond to questions on the golf membership. 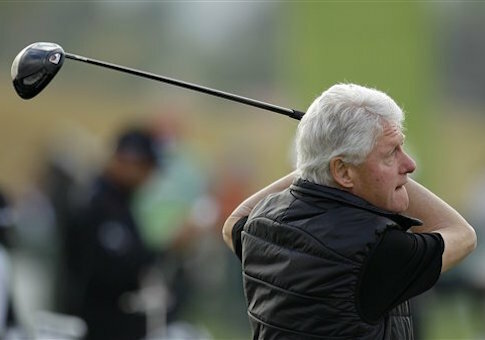 The presumptive Democratic presidential nominee has played at Trump National as well. As a "gift" for his 65th birthday, Bill Clinton was joined by Hillary Clinton, Chelsea Clinton, and Marc Mezvinsky for a round at the course. "This year on my 65th birthday … Hillary and Chelsea and Marc took me to the golf course, to Trump," Clinton told Golf Digest. Clinton praised "the Trump people" for reorganizing tee times at the course so that the foursome wouldn't slow down the course. "Chelsea hadn’t played since she took lessons when she was at Sidwell, and Marc never plays," he explained. "The Trump people were great: They organized all their tee times so we wouldn’t delay anybody. We schlepped around nine holes together." Actor Samuel L. Jackson said earlier this year that he once played golf with Clinton at a Trump course. "[Trump] called me one day to play golf, not to play with him but to play with a friend of his, and I went to play with that friend of his, and that friend turned out to be Bill Clinton," Jackson said. It is unclear when Clinton last played a round at a Trump course. This entry was posted in Politics and tagged 2016 Election, Bill Clinton, Donald Trump, Hillary Clinton. Bookmark the permalink.